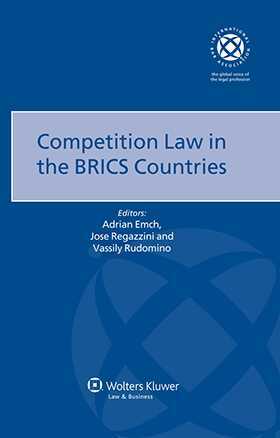 At a time when the BRICS antitrust agencies are increasingly asserting their roles in a multipolar antitrust world and cooperating with each other more and more, this thorough and up-to-date comparative analysis on what the BRICS countries are doing in the antitrust sector will be extremely valuable to corporate counsel worldwide. For academics and policymakers it will provide a highly revealing perspective on the current state of international competition law enforcement. About the International Bar Association. Chapter 1. Brazil ; V. Marques de Carvalho, M. Calliari, D. Alves Guimarães, O. Zago Chinaglia. Chapter 2. Russia; I. Artemyev, V. Rudomino, A. Numerova, G. Zakharov, A. Rokhlin, R. Nikitina, L. Merzlikina. Chapter 3. India; S. Gaur, C. Shroff, N. Kaur Uberoi. Chapter 4. China; Ning Wanglu, S. J. Evrard, Y. Zhang, J. Su, X. Yang. Chapter 5. South Africa; S. Ramburuth, D. Unterhalter, R. Legh, P. Steyn. Chapter 6. Comparative Overviews; Wang Xiaoye, M. Reysen, P. Rincazaux, T. Janssens, C. Lavoie, W. E. Kovacic.